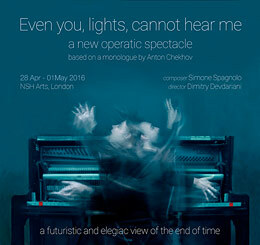 A new operatic spectacle exploring a futuristic and elegiac vision of the end of time, Even you, lights, cannot hear me is a new operatic spectacle based on a monologue from Anton Chekhov's The Seagull. Two singers, depicted as two beings embodied into one entity, wonder a surreal, yet exquisite cosmos, in which nothingness and wholeness coexist, timelessly. Composed by award-winning artist Simone Spagnolo and directed by visionary theatre practitioner Dimitry Devdariani, this work gives a whole new life to Chekhov's powerful writing, whilst challenging the contemporary notion of opera and music-theatre. Try to imagine a spaceless world, where a two-headed creature sings, water constantly flows, and the sound of a piano echoes through all its keys: this is the world of Even you, lights, cannot hear me. 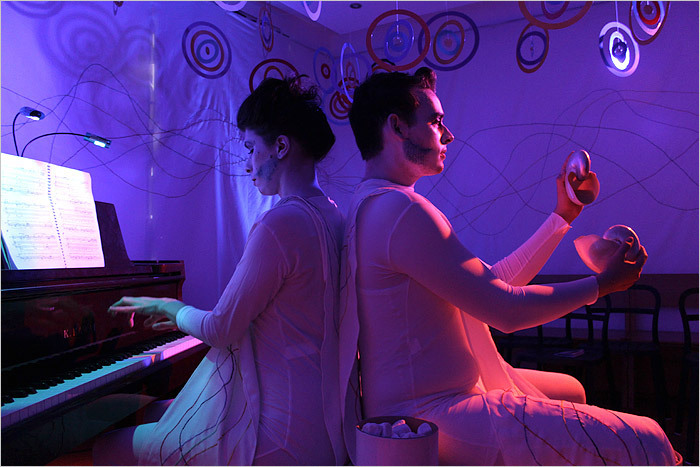 An operatic experience, an inextricable blend of music and theatre. A glimpse of life after the world's end. 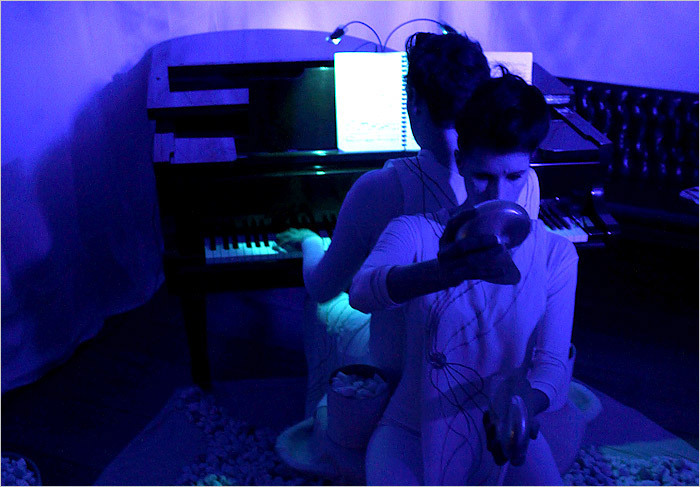 This special composition, scored for two opera singers doubling on piano, pebbles and water, was kindly hosted for four unique performances at London's NSH Arts. The cast: Kate Symonds-Joy, James Schouten. Translated into English by Dimitry Devdariani. 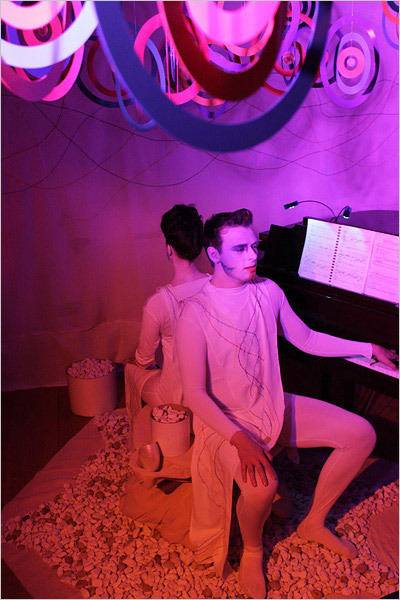 Costume and set design by Alice Seille. Lighting design by Richard Hillier. Special thanks to Nick Hugh of NSH Arts. 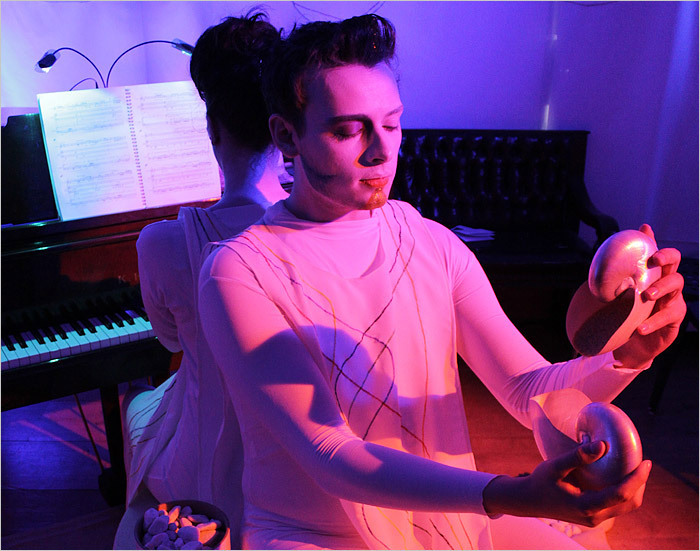 Performed at NSH Arts, London in April 2016.